It’s just about time to begin thinking about your St. Patrick’s Day menu. We have a pretty traditional menu of corned beef, cabbage, roasted potatoes and horseradish sauce. I usually make my corned beef from the recipe in The Silver Palate, one of my favorite cookbooks, because I’m crazy about the marmalade glaze for the beef. I usually sauté thinly sliced cabbage to go along with it. This year, though, I’m trying a different recipe for the cabbage, one that I tested earlier today. Melissa Clark, a star columnist for The New York Times Dining section, has a terrific recipe for Crispy Roasted Cabbage in her stellar cookbook, Cook This Now. I’m crazy about Melissa, a huge talent in the kitchen. Her warm, breezy writing style makes me feel inspired to expand my own cooking skills. She feels so friendly that I’m sure she could show up right now in my kitchen and we’d cook up a storm together. But, back to cabbage – I am a stickler about avoiding the wet, floppy cabbage that usually accompanied New England boiled dinners when I was a kid. I want mine crisp, almost crunchy, seasoned with some sea salt and some freshly grated nutmeg, a trick my mother taught me. A crispy cabbage recipe, oven-roasted. Cut the cabbage into 1-inch-thick pieces. Place on a sheet pan and drizzle with half the olive oil and sea salt. Roast, turning once, drizzling with the rest of the olive oil, until crispy and browned, 25-30 minutes. Sprinkle with nutmeg, garnish with large-flaked sea salt and serve. Have never used nutmeg on cabbage! I am going to try this Liz, I just went through 20 pounds of cabbage making Kim Chi and Cortado for the markets–so I can’t look at another cabbage until next week. XO, beautiful pic as well. 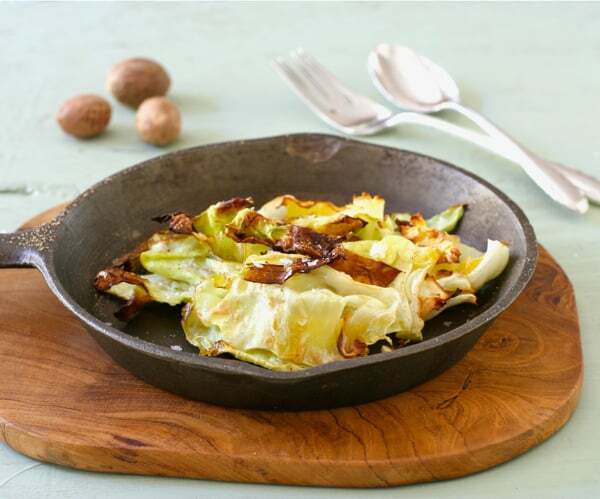 When you can bear to look at another cabbage, try the nutmeg – it’s terrific with cabbage. Thanks, Wendy. Love this Liz, I love cabbage but frantkly get tired of how limp it can be, your crunchy cabbage is the answer. Going to try this and really anxious to try the nutmeg addition. Thanks, Suzanne – it tickles me that my Mom’s suggestion about nutmeg appeals to both you and Wendy. She always insisted on freshly grating the nutmeg… Stay warm – Spring is coming for you and your sweet pooch. Crispy cabbage sounds like a great alternative. I will try this. I think Melissa Clark is one of the best cooks out there right now. I love just about everything she does. This recipe is right up my alley – I absolutely love it. I’m making it this week – and this photo is one of my very favorites of yours, dear Liz. Brava!!!! Thanks, Susan, I almost didn’t post it – was disappointed in my photos – but the little vintage fry pan came from Larry’s home town in northern WI – a thrift shop find. Over 15 years ago I remember trying grilled romaine lettuce. It was amazing! And roasted cabbage? Even better! I remember grilling romaine too – thanks for the idea! Looks great! Nutmeg and cabbage is new to me. I’ll give it a try. Hope you like it – thanks for your comment.